Blues is the most important harmonica style. Once you have learnt the basics, you will be able to play blues with musicians everywhere. Blues Harmonica Type (or Blues Harp) is name used in the Americas. But in Asia, people call Richter-tuned harmonica, or 10-hole harmonica, is the most widely known type of harmonica. It is a variety of diatonic harmonica, with ten holes which offer the player 19 notes (10 holes times a draw and a blow for each hole minus one repeated note) in a three-octave range. Although there are three octaves between 1 and 10 “blow”, there is only one full major scale available on the harmonica, between holes 4 and 7. The lower holes are designed around the tonic (C major) and dominant (G major) chords, allowing a player to play these chords underneath a melody by blocking or unblocking the lower holes with the tongue. The most important notes (the tonic triad C–E–G) are given the blow, and the secondary notes (B–D–F–A), the draw. The valved diatonic is one of the most common ways of playing chromatic scales on diatonic harmonicas. While chromatic is available, valved diatonic is also common, and there are reasons to use a valved diatonic rather than chromatics. It does not have a slide assembly (so that it has less air leakage), and it has a wider tonal range and dynamic. As well, it has a smaller size and is much more suitable to use with microphone, and it is still cheaper than chromatic, even for a premade one like Hohner’s Auto Valve or Suzuki Promaster MR-350v. Valved diatonics are made by fitting windsavers on draw holes 1–6 and blow holes 7–10; this way, all reeds can be bent down a semitone at least, although most players can easily bend down a whole tone. Alternatively, one can simply buy a factory-made valved diatonic such as the Suzuki Promaster Valved. The disadvantage of the valved diatonic is that it does not require one to develop proper embouchure in order to bend the notes accurately. Also, many of the notes reached by bending are nearer just intonation, and the slightly lower equal tempered pitches preferred by western classical music are unattainable. This limits the number of chromatic notes available when playing classical repertoire when compared with that of jazz or blues. Another thing worth noting is that, due to the valved bends being one-reed bends, the sound is less full than traditional bends, and may seem dull, making it less dynamic. One way to address this is by having an additional reed that activates when one bends a note; this is the philosophy of Hohner’s XB-40 and Suzuki’s SUB30 Ultrabend. Aside from bending, Richter-tuned harmonicas are modal. Playing the harmonica in the key to which it is tuned is known as “straight harp” or “first position” playing. For example, playing music in the key of C on a C-tuned harmonica. More common (especially in blues and rock) is “crossharp” or “second position” playing which involves playing in the key which is a perfect fourth below the key of the harmonica (for example, on a C tuned harmonica, a second position blues would be in G—resulting in the instrument playing in mixolydian mode). This is because the notes of the G pentatonic scale (a commonly used scale in blues and rock) are more easily accessible on a C-tuned harmonica. The lower notes of harps in the lower keys (G through C) are easier to bend, but take more wind. Since much of crossharp is played on the inhalation, every opportunity for exhalation must be capitalized upon—by blowing out lots of air on every exhaled note and during every pause. Crossharp lends itself to seventh and ninth chords (particularly G7 and G9) as well as blue notes (particularly on D chords, where the harmonica is tuned to play D minor while the other instruments play D major). Another method is to play in the key one whole tone above that of the harmonica. On a C-tuned harmonica, this would mean playing in the key of D. This is known as “slant harp” or “third position” playing, and results in the harmonica playing in dorian mode. This is much less intuitive as it requires the ability to bend notes completely accurately, and there are fewer useful chords available than in 1st or 2nd position playing. The technique offers many notes that are not achievable in the other positions without overblows, such as the blue note on the third degree, which may or may not be favorable depending on the circumstance. The bends available at the lower end of the instrument also make playing melodies in a D major scale relatively easy for those who have any semblance of proficiency at the bending technique, though most of the notes (all but the second and fourth, E and G) in the scale are on the draw, requiring great skill and strategy in exhaling, even more so than in crossharp. Note that using blue notes, any of the seven positions can be used over music in its corresponding major scale if only the notes in the corresponding pentatonic scale are played. Some players prefer specially tuned variants of the diatonic harmonica. 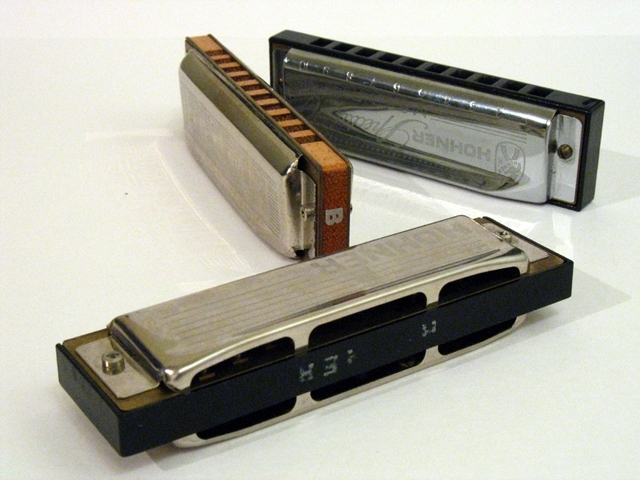 Several manufacturers, for instance Lee Oskar Harmonicas, make a variety of harmonicas to help players used to a “cross-harp” style to play in other styles. Cross-harp players usually base their play around a mixolydian scale starting on 2 draw and ending a 6 blow (with a bend needed to get the second tone of the scale; a full scale can be played from 6 blow to 9 blow). Lee Oskar specially tunes harmonicas to allow players to play a natural minor or major scale from 2 draw to 6 blow, or a harmonic minor scale from 4 blow to 7 blow. Below are some sample layouts (the key labels describe the scale from 2 draw to 6 blow, whereas traditional harmonicas are labelled according to the scale between 4 and 8 blow). Country tune: Identical to standard Richter tuning, except hole 5 draw is raised a semitone. With the major second on 3 blow (where, in standard Richter tuning, the cross harp tonic would be repeated) and a major 7th (rather than a minor 7th) on 5 draw, the Melody Maker has a full major scale. This can be very useful for playing major key melodies, for example, fiddle tunes, quickly, without having to do a lot of precise bending or overblowing. This tuning, designed and marketed by Lee Oskar, is a particularly interesting evolution of the harmonica, since it allows a player accustomed to playing “cross harp” (in Mixolydian) to play in a major key (which is what the standard layout is designed for in the first place). Rather than providing the standard tonic C and dominant G7 chords, the Melody Maker provides a GM7 chord (2–5 draw), a C6 chord (1–4 blow), an Am or Am7 chord (3–5 or 3–6 blow), a D chord (4–6 draw) and a C chord (6–10 blow). If we are in the key of G, then, the melody maker provides the I chord, the IV chord, the V chord and the ii chord, allowing ii–V–I progressions as well as I–IV–V progressions. It is also possible for harp players to tune the harmonica themselves. By making small scratches in a reed, the note played can be changed. It is possible to either get a higher or a lower note. Some harp players make extensive use of these modifications. One of the most famous examples is the harp solo on “On the Road Again” by Canned Heat, on which the harmonicist, Alan “Blind Owl” Wilson, gets the minor third crossharp on the sixth drawn reed, which is normally the major second crossharp. There are books, toolkits and guides to tuning and harp customization available on the Internet; anyone interested in trying their hand at tuning should be prepared to sacrifice a few harmonicas during the learning curve. Hohner had made a few non-standard harmonicas. All of them have more than 10 holes and are labeled “grosse richter”. For 12 holes, Hohner makes the M364 Marine Band, as well as the M36460 Marine Band Soloist. The Marine Band Soloist is solo tuned, with 3 full diatonic octaves with all notes of the major scale of the key of C.
Since it can bend notes in the same way as a regular diatonic harmonica in the middle octave, some players use this for blues (and even jazz) instead of the more well-known solo-tuned harmonica, the chromatic harmonica, since the bent notes sound very different from true semi-tones. (For layout, see below at Chromatic harmonica, key out) In this configuration, blues players usually play in the third position, the D-minor blue scale. In addition to the M364 models with 12 holes, there is also the Hohner Marine Band M365 14-hole harmonica. The general dimensions of the 12- and 14- hole Hohner harmonicas are a bit bigger than regular diatonic harmonicas. The M36401 and M36501 harmonicas (in the key of C) are pitched one octave lower than the standard 10-hole C diatonic. Thus, hole-4 blow is the same pitch as hole-1 on a regular diatonic harmonica in the key of C. The Marine Band M36408 and M36508 (in G) are similar to a usual G diatonic, having the higher end expanded. Holes 1 through 4 and 6 are draw-bendable, and holes 8 through 14 are blow-bendable. Note the extra holes 11–14 which in theory extend the bending capabilities a lot (from A down to E in hole-14, for example), although in practice these are quite limited. This harmonica opens up lots of interesting possibilities, especially for blues harmonica, like extended tongue-block octave playing, the possibility to play exactly the same 2nd position riffs in two octaves, etc. Two harmonica models have been released with altered designs that allow for increased bending abilities, and in effect, chromatic playing on a diatonic harmonica. They are often referred to as “extra-reed” harmonicas, because they carry more than the usual 20 reeds of a diatonic harp. The Hohner XB-40, invented by Rick Epping, features an entirely new body design, though in practice, it is still a Richter-tuned (diatonic) harmonica. Here the blow reeds and the draw reeds are sealed off one from another with valves, effectively creating two separate cells in the comb for each hole in the mouthpiece: one for blow and another for draw. A second reed is then placed in this cell at a zero-offset (no gapping) so that it does not sound under normal playing. However, it is placed on the opposite side of the reed-plate from the speaking reed and tuned so that it responds when the player “bends” the note downwards in pitch. This allows for every note on the XB-40 to be bent downwards a whole-tone or more, whereas on standard diatonics only certain notes (the higher-pitched in the cell) will bend at all. The other Richter-tuned harmonica of this kind is the Suzuki SUB30 Ultrabend. Where the XB-40 uses valves and a total of 40 reeds, the SUB30 takes a different approach. Each hole of the harmonica houses a third reed, totalling thirty reeds altogether and thus, where the harmonica draws its name. The third reed is dubbed a “sympathetic reed”, tuned one tone below the pitch of the lowest note, and is normally passive to airflow. The reed becomes active when the player uses the bending technique, allowing the low note in each hole to be bent down one semitone. Unlike the XB-40, the SUB30 retains the typical shape and size of most other ten-hole diatonic harmonicas.